The first picture of Priyanka Chopra and Nick Jonas at what is supposedly their roka ceremony in Mumbai is here. 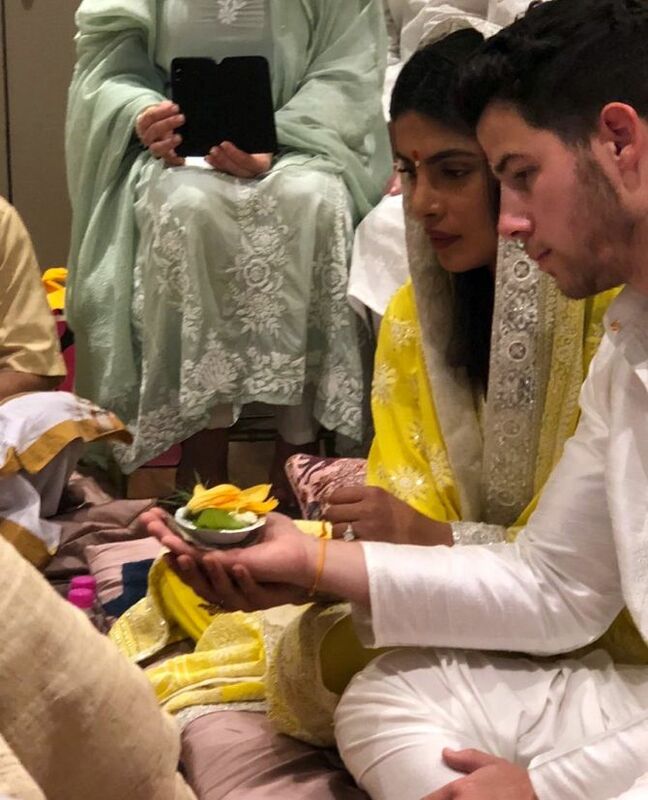 In the picture, Priyanka and Nick can be seen dressed in traditional Indian outfits. The roka was reportedly attended by Priyanka's cousin Parineeti Chopra, who flew back to Mumbai from a shooting schedule, and other family and friends. Earlier, a priest was seen entering Priyanka's building with two bags followed by a man carrying sweet boxes in a bag. Also, a mini tempo arrived with caterers and food items. Nick, 25, arrived in Mumbai on Thursday with his parents -- Denise Miller-Jonas and Paul Kevin Jonas -- and they were seen carrying a Tiffany & Co bag, the famous jewellery brand from whose London store the American singer bought the engagement ring. They were received by Priyanka, 36, at the Chhatrapati Shivaji International Airport in Munbai. Last night, the couple walked hand in hand at JW Marriott hotel in Juhu for a dinner along with their families. The couple will reportedly be throwing a party for their friends and family at her residence today in to celebrate their July engagement.